Report by the Branch Chairman Wg Cdr Ross McKenzie. The Memorial at Rebecq this year coincided with the 70th anniversary of the tragedy of the 550 Squadron Lancaster aircraft JA 712 that fell in Rebecq, on May 28th 1944. To mark this anniversary, the Major of Rebecq and our colleage Guy De Braeckeleer, Chairman of the Rebecq Memorial Association, invited many including the RAF and RAFA to join the local community in solemn tribute for the Lancaster crew, and five other crews of 550 Squadron North Killingholme that crashed in Belgium in 1944. The six tragedies caused the death of 37 airmen from the 42 aircrews involved. Of the five survivors, four were capture and ended up as Prisoners of War, and one escaped under the protection of the Belgian resistance. 22 civilians from Rebecq involved in the rescue of the survivors were also arrested by the occupants. 3 of these never returned from the concentration camps, where they died. The ceremony was a moving tribute. As well as the usual suspects attending on the UK side, including the UK Ambassador to Brussels, RAF and RAFA representation and the parading of the RAFA Standard (thank you JP), it was delightful to see the local school children attending and actively participating in the ceremony laying the multitude of wreaths in remembrance. As a slightly biased pilot observer I can state that the highlight of the ceremony was the impeccable to the minute fly-past 3 ship formation of helicopters from the Belgian Air Component, low level directly from behind the memorial and over the crowd line. Poignant and professional. Post event the Belgian community laid on a wonderful spread in the beautiful village of Rebecq. Local beer and good company in a wonderful setting between the network of streams and small bridges and Cotswold style rustic properties in the heart of Rebecq. The highlight post event was certainly meeting the UK families of the crews who had served both on the Lancaster that had crashed in the village in May '44 (who had only finally made the connection themselves some 3 years ago having researched their family history with assistance from local historians back home, and the RAF's Air Historical Branch), and the members of the broader association of 550 Sqn who had been regular attendees at the event. "Already, I am anxious to thank all those who somehow or other, made that this celebration can take place. I am also anxious to express my gratitude to the Belgian and foreign military, civil and diplomatic authorities which supported us in our initiative of memory. So that, we never forget. Further detail, photos and history can be found on www.rebecq-memorial.eu, including links to national and regional french language tv reports (RTL and TVCom) of the event. Service of Remembrance at Hotton-sur-Ourthe and at the Commonwealth War Graves Cemetery 4 May 2014. As arranged by the Brussels Branch of the Royal British Legion in association with the municipal authorities at Hotton-sur-Ourthe, a fine service of remembrance was held in brilliant sunshine on Sunday 4 May 2014. The event started with a Church Service and Mass in the Church at Hotton, followed by wreath-laying at the memorial to the dead of the two World Wars. The large crowd then followed the magnificent town band up the hill the the Commonwealth War Graves Cemetery, which was, as ever, perfectly presented and a fine tribute to the work of the CWG Commission. 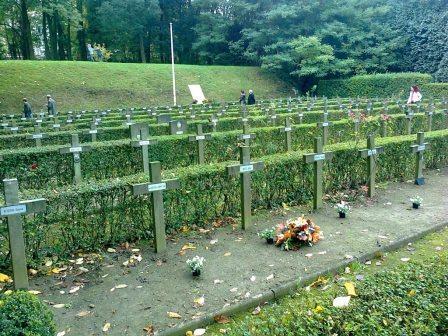 173 airmen are remembered in the Cemetery, including those who died in the crash of Halifax MX 829 at Tigelot on 2 November 1944. The Service of Remembrance was led by the President of the RBL Brussels Branch Brigadier Andrew Fisher. Moving tributes were paid by the British Ambassador to Belgium Mr Jonathan Brenton and RBL veteran Rainer Hiltermann. The Branch was strongly represented with Mrs Brigitte Horton and Mrs Deborah Whittingham in attendance; the Branch Standard was paraded by Jean-Pierre Blanckaert and a Poppy Wreath was laid by Gp Capt Whittingham on behalf of the RAFA Belgian Branch. The RAFA group joined the strong RBL representation for a most convivial combined lunch after the event. Photographs below courtesy of Brigitte Horton and Mr Doug Mitchell: for the full set go to the Branch Flickr site. 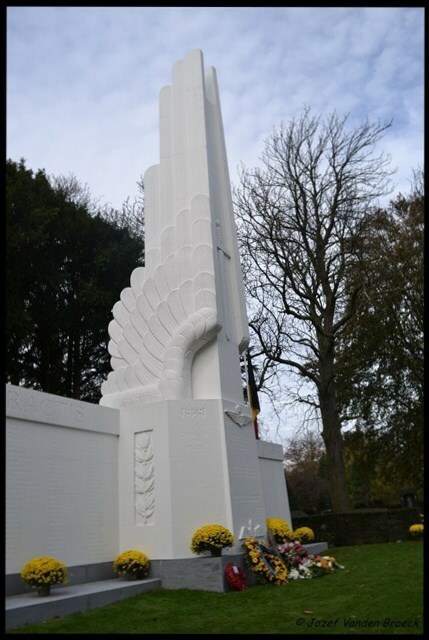 As arranged by the ‘Comité de la Pelouse d’Honneur des Aviateurs’ in collaboration with the Belgian Air Force and the ‘Vieilles Tiges de l’Aviation Belge’ (VTB), a ceremony was held at the Brussels cemetery on 1 Nov 13 to pay homage to Belgian airman who died in WW2. Lt Gen Wilfried De Brouwer President VTB led proceedings. 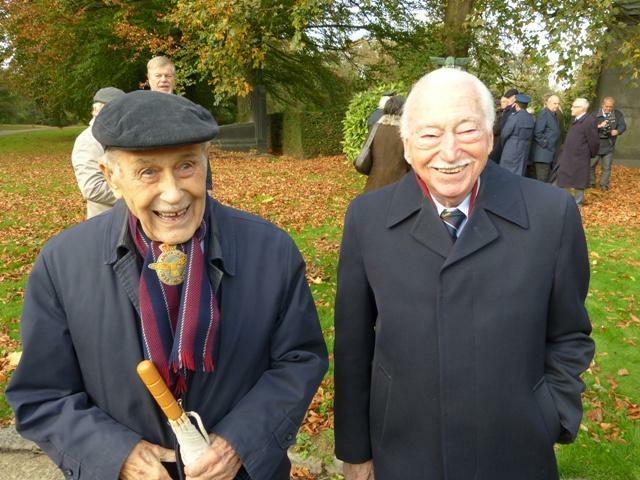 Pride of place amongst the many senior Air Force attendees was taken by ex-RAF RAFA Life Members Bobby Laumans and Fernand Jaumoulle. The Branch Standard was paraded. Warrant Officer Gary Warner and the Chairman laid wreaths on behalf, respectively, of the United Kingdom and the RAFA on the Field of Honour and at the Commonwealth War Memorial. The Comet Line Annual Reunion was held in Brussels on the week-end of 19/20 Oct 13. A special focus this year was the 70th Anniversary of the execution of the 11 Comet Line helpers on 20 October 1943 and of the death the previous month of Baron Jean Greindl ‘Nemo’ the Comet Line leader in Brussels who was killed in his prison cell at Etterbeek as a result of a stray bomb dropped from an Allied aircraft. The Comet Line Helpers were executed at the National Rifle Range (Tir National) in Schaerbeek, Brussels. The Sunday commemorations started with a visit to the cemetery and memorial at the ‘Enclos des Fusillés’ on the site of the Tir National: the Comet Line and RAFA Standards paid tribute as flowers were placed at the graves and as the bugle sounded. The normal Church Service in the Koekelberg Basilica was followed by wreath-laying at the Comet Line Memorial, where special tributes were read to the martyrs of 20 October 1943, and in the Air Force Chapel. A grey day but, for a change, no rain and not too cold for the annual commemoration at the Belgian Air Force memorial at the Cinquantenaire (below left). 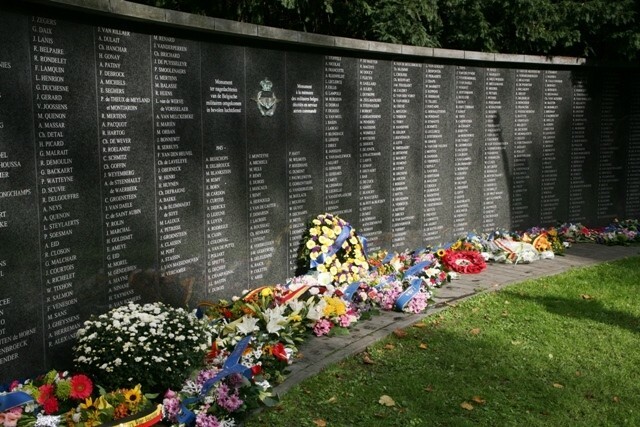 As normal, a large crowd paid homage with many wreaths laid by Belgian and International organisations. The Branch Standard was paraded, and a number of Branch members attended including Hélène Van Wersch and Bobby Laumans (below right). The Chairman laid a RAFA wreath. Returning from a mission to Nuremberg in Germany on 28 August 1943, 77 Squadron RAF Halifax Bomber JD371 KN-O was attacked by a German fighter and caught fire. Four men managed to parachute before the crash, one of them did not survive. The plane was moving straight onto the village but the pilot, with complete disregard for his own life and those of the other three crewmen remaining on board, managed to divert the aircraft which crashed into a meadow. The 3 crewmen who parachuted to safety (FS Catley, and Sgts Beard and Palmer) subsequently managed to return to England via the Comet Line. Those who died (PO Brannigan, FSs Humphries, Rogers and Silver (RCAF), Sgt Templeton) are buried in the Commonwealth War Grave at Heverlee, Belgium. On 28 August 2013, the Halifax Modave group in collaboration with the Municipality of Modave organized a most moving commemoration of the tragic events of 70 years earlier. The day started with a ceremony in the City Hall of Modave where in the presence of members of the families, the eight crew members were posthumously made honorary citizens of the Municipality. 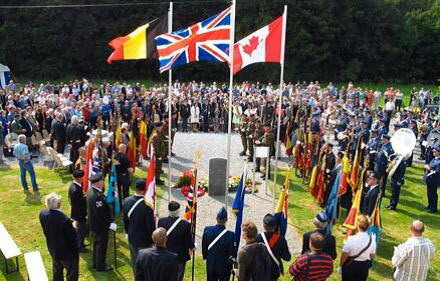 Later at the crash site in bright sunny weather a large crowd accompanied by the Belgian Air Force Band, a Guard of Honour and a fine group of Standard Bearers, witnessed the unveiling of a new monument to commemorate the event. “In the night of May 12, 1944, a British RAF Bomber, the Avro Lancaster ND700 PM-X of the 103 Squadron, crashed while burning in the woods between Blommerschot and Heihuizen, near the Town of Malle. To commemorate this event, the Town of Malle with the Association Aero-Para Club der Kempen (APCK) will hold a Memorial on the 4th of May 2012 at the Airfield of Malle, at 12.3O sharp. During the Memorial a Commemorative Plaque will be unveiled. Various next of kin and friends have been invited and some of them will attend the Memorial. The Avro Lancaster ND700 PM-X had a full experienced crew, led by Wing Commander F/O Florent VAN ROLLEGHEM born 1912 at Dendermonde. However, on the 12 May 44, the captain was ill, and his crew was led on its last mission by Wing Commander Hubert Reginald GOODMAN, Royal Hellenic AFC. The ceremony on 4 May 12 was well organised and attended by Embassy Delegates of Great-Britain, Canada and South Africa. Delegations from the Royal Air Force, the Belgian Air Force, Belgian Army, RAFA Belgian Branch, RBL Brussels and many local organisations also attended. Our Standard Bearer of RAFA, Belgian Branch, Jean-Pierre Blanckaert and the Standard Bearer of RBL Brussels showed the importance for our British Associations. At the important moments of the ceremony a bagpiper underlined the dignity of this commemoration. A poem made by a RBL Antwerp Branch member, was being read by him to set the right spirit of this Memorial. The distinguished Mayor of Malle started speaking, followed by the Delegates. The Commemorative Plaque was unveiled and the wreaths were laid. Ours was laid by RAFA member Mr John Sutherland. An exhortation by the RAFA Chaplain was followed by the trumpet sound of Reveille. 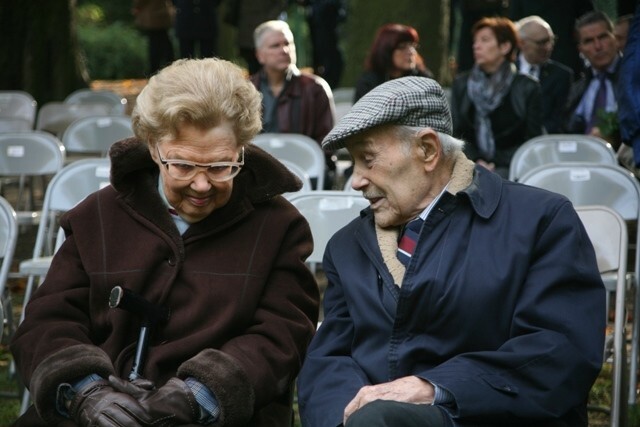 Members of ‘Wings of Memory’ from Geraardsbergen took a very large part in the impeccable screenplay of the ceremony. It was a dignified Memorial event. Every possible detail had been taken care of. The welcome was particularly friendly, as was the following reception. There was a display of Lancaster parts found after diligent search. The fly-by of a Lancaster was delayed for two hours, due to the appalling weather conditions on the British Channel.